Medieval use of yeast. Using it in the CMA. NOTE: See also these files: BNYeast-art, bread-msg, beverages-msg, beer-msg, mead-msg, breadmaking-msg, leavening-msg. Not that bad at all. Only had problems with juices left out. > How do you keep the wrong yeasts from the wrong beverage? > I'm assuming you are using different yeasts for beers, ales and wines. > You're not doing bread making are you? Nope. My mother-in-law does that. > have to leave them open to the air for long, but..
pug at pug.net | beautiful poems. When ever shall we meet again?" > would not be a leap of logic to use packaged yeast for baking and brewing. century) it is taken from A Booke of Cookry. To seeth Roches, Flounders, or Eeles. Almost all the sauce for fish include yeast, which I found interesting. 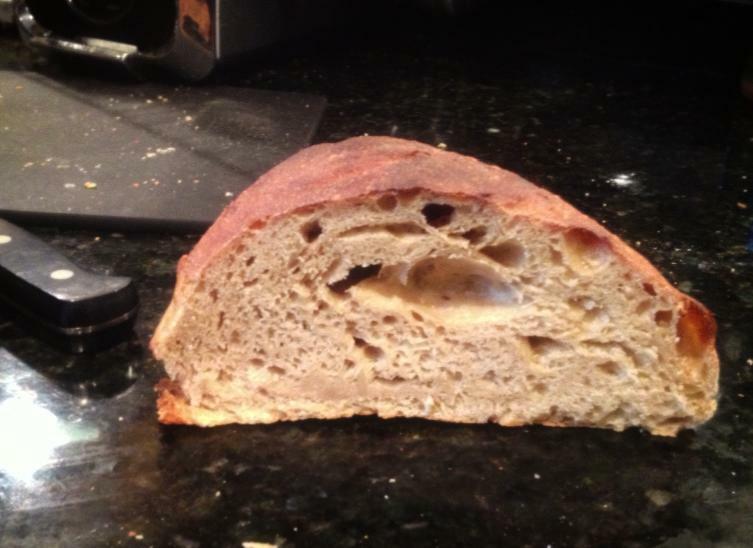 since using sourdough occurs rarely relative to yeast, I doubt that's it. More than that, I can't say. ways that our early ancestors used to harvest these yeastie beasties. Alewives, would make rush brooms which they used only to stir their brew. Toast or bread was added to some brews to impart "their flavor." yeast help produce food and beverages of varied kinds. a leavening agent prior to the late 18th century." food and cooking for the Society. Lord Mandrigal of Mu, Master Oldenfeld Cooks Guild. > Yeast, as we know it, would most definitely have been used in period times. > is my opinion that medieval breads could be likened to *sour dough* bread. practice to throw it away and start a new batch. Both books spend a lot of time on yeast in english cookery. faciendum brakott - "...put therto newe berm..."
Bragget - "... do gode berme aboue..."
Mynceleek - "...do theryn a litel berme or a litel sourdoug"
& Salt..."; Rastons - "...than take warme Berme...". Houssolde"] To mak rostand - "...a litill yest of new ale..."
domestication of North American wild airborne yeasts. tolerance for alcohol - a toxic waste product to the yeast. > own, without the sour taste and all. produces a sourer leavening than the ale barm used by the German tribes. decant the liquor when the yeast grows. Use the liquor for leavening. be extremely interested in what your results were. to swap one kind of packaged yeast for another usually doesn't work. manors and probably remained that way through the period we recreate. although I have found no evidence to support this. feeling experimental, starting with an ale barm is probably advised. barm (the foam on top of the ale pot) as bread leavening is documented. beers are some form of ale. collecting beer yeast really would be scraping the bottom of the barrel. > manors and probably remained that way through the period we recreate. trough, and subsequently "restarted" each time baking was done. >instance, cause a decided bitter flavor in the finished product. teaspoon of yeast and two pounds of flour. I learned some things about using yeast in solution over the weekend. remove some of the taste of the bittering agents (like hops) in the ale. returned to the yeast jar. hours. They were baked at 400 degrees F for 45 minutes. doughy texture and a taste which could be kindly described as terrible. and you get the best mix of yeast by stirring before decanting. > > It is two envelopes primarily to get a good rise quickly. > is equivalent, but not when it comes to packages. approximately 1/2 of one of Ulf's 50-gram cakes in Sweden. > beer with a German name I don't recall at the moment (hefe something?). > into yeast for bread. I've estimated that you need about 1 oz. of fresh ale barm to leaven 2 lbs. stir up the leas, and decant the leas into the solution in your canning jar. the barm can be stored in the refrigerator for several weeks to months. have) as a bread starter, but it would be an interesting experiment. into a printed cookbook and venerable family recipes of undeterminable age. inconvenience in making this yeast is the danger of cloudy or wet weather. little windy, so much the better. the soft kind, but it is very convenient. malt, (which may be obtained from a brewery,) and two handfuls of hops. warm water, allowing a lump the size of a hickory-nut to a pint of yeast. This will correct any tendency to sourness, and make the yeast more brisk. Strong yeast is barm from the brew pot. Pearl-ash is cream of tartar. > 5-10 days) it just sort of lays there in the bowl. > Is this normal, or should I start again? Any tips? until the loaves are brown and sound hollow when thumped on the bottom. hooch and will become alcoholic in a short time! > the starter if this happens. it became infected with mold. If you leave it unsealed, be ready to use it every day or two. helps keep out molds and other undesirable critters. their sourdough starter in a pocket. > their sourdough starter in a pocket. overnight, and worked well as a starter. > overnight, and worked well as a starter. ale barm to get a good rise in a reasonable time. stuff I've found in 19th Century recipes. have been "cheaters" (using store-bought yeast to make the starter). the store will not generally do the same. >wondering. I was hoping Adamantius or Bear or someone could answer this. so you get a faster start, and generally more bang for your buck. Not Adamantius, nor Bear, but a baking freak, nevertheless. of packaging: a strip of three 1/4-oz packets and a 4-oz glass jar. " available in a strip of three 1/4-oz packets. " soy-free, sugar-free, no-MSG and vegetarian diets. There is more info on the Fleischmann's site. > covered with thin cheesecloth. Except in a sterilized environment, yeast spores appear to be ubiquitous. covered container and still get fermentation. > done it in period" assumption that I am so well known for. augmented with crushed barley for their brewing. crazy brewer who had the ale pot die. container and store in the refrigerator. expansion. STore in a covered jar in the refrigerator. 3 cups milk, whole or skim 2 cups unbleached white flour. towel and let sit in a warm place for several days, until foamy and soured. > knead and place in a greased bowl. And then let it stand for 1.25 hours. > Yeast in place of the other screw this up? written, it calls for a dry active yeast. really don't need the sugar, but it activates the yeast faster and better. > rapidly as the fresh yeast. milleri, a strain of Saccharomyces exiguus, and Lactobacillus sanfrancisco. The reaction does not occur with S. cerevisiae (regular bread yeast). fermentation of the maltose and provides the characteristic sourness. in the flour will use the sugar to ferment the dough and create a sourdough. organic compounds which may be susceptible to molds and other infections. fed regularly to keep it from dying. will take 1 to 2 hours. > > The reaction does not occur with S. cerevisiae (regular bread yeast). > yeast, which might help account for the phenomenon. active yeast to leaven your bread, you are using the equivalent of ale barm. Most, if not all, of the top fermenting brewer's yeasts are variants of S.
which were previously used in beer making. The symbiosis between C. milleri and L.sanfrancisco occurs because C.
the amylase reaction. This leaves the maltose free to be used by L.
fortuitous combination optomizes fermentation and sourness. Apparently, S. cerevisiae is a little wimpy in high acid environments. to have been made only in Bohemia until fairly late in the SCA period. yeast. In period, the same yeast was used for both. Subject: RE: SC - OOP - Sucess!! is called creaming the yeast. The more active the yeast, the more scum. them, let me know and I'll locate and send you a copy of a previous posting. Subject: Re: SC - re: SC-OOP - Sucess! >> should be foaming noticeably. foaming, discard the yeast/water mixture and start over with fresh yeast. > A teaspoon of yeast is approximately 1 package. I thought a package was about 2-1/4 teaspoons -- a short tablespoon. than the little envelopes, or even the little jars. > > A teaspoon of yeast is approximately 1 package. > I thought a package was about 2-1/4 teaspoons -- a short tablespoon. rounded teaspoon. Two packages will give you a short tablespoon. I believe King Arthur Flour sells Lactobacillus SF. > lactobacillus. But it does have a strong sour taste. > to breads that were baked using barm. generally sourer than wheat based starters. wrapping it in foil to give to people who are interested in trying it. > Seriously does yeast just not like some people? Is bread like gardening? > but mock my wishes for it to rise. dough, because it sort of "kick-starts" the yeast. > the density one would look for in oak furniture? Think kind thoughts at the miserable little yeastie beasties. Store yeast in a sealed container in the refrigerator. pounds or less. One teaspoon equals a 1/4 oz. package. Proof your yeast. Take a cup of water at 90 to 110F put it in a bowl. use the faster rise, except when making sourdoughs. requires more rise time to aerate and expand. available in the deep south which fall below 9 percent. the rise and the density of the bread. > fellas like to live in. Subject: Re: SC - Small Beer? out at lower alcohol levels (about 3.8 to 4.3 percent in my experiments). > went back looking for it, guess who posted it? > Glad you like the recipe. out as dry as possible, so it is used for dry and high alcohol wines. is frequently sent in most of the "sweet" wine kits, like "raspberry merlot". That is why I recommended it for this purpose. I think you should at least give it a try. > and true ale yeast. bread recipes use barm for the yeast. Subject: RE: SC - yeast/alcohol was: small beer? you end up with is ??? Might this be the source? > will you be able to sustain it for some time? Funnily enough, I discovered something just last week regarding medieval leavening that you might find interesting. > Is "Wyeast" the name of a company? > start with fresh barm? > your starter is, how lively it is, so I'm guessing the answer is no. My guess is that this is going to be a matter of trial and error. found I had to play with all my sourdough mixtures on the day of baking. which require "A full quart of Ale barme". construct a recipe that didn't involve making an ale barm to start. there about his various starters. the potency of the yeasty beasties. The second rise will be faster. for one to two pounds of flour. > 2 loaves from it. enough yeast by skimming the top. dipping (a one gallon jar perhaps) using malt extract and brewers yeast. that wouldn't be the object of the exercise. tried, so please keep me posted on how it is doing. > bread that was several days old might have been quite tasty. loaf and the flour mixture. > Making a few loaves of whole wheat bread, and experimenting a little. > and the other with my starter. > slow, but the yeast was quite perky, much like using regular yeast. the difference in the activity. climate. Ale doesn't do well in warmer climes. information from David and Toussaint-Samat). Ages (IIRC), so my answers may lie there. gluten level of the flour. > kinds of flour determine what kind of sponge it will ultimately become? > For example using a lower gluten flour versus a higher gluten flour. Subject: Re: [Sca-cooks] yeast reservoirs? > thing to keep in mind when wondering if a bread is leavened or not. > that it would affect the dough? that it would affect the dough? bread" (as we called it) that didn't rise. be mentioned in the recipes. throwing this one to the list. but you can get away with half that amount if you extend the first rise. commercial bakers retain five to ten pounds of dough as starter. > of course that it may not be mentioned in the recipes. > this one to the list. there are a number of images that can be found. to them to feed the the leven. 1 tablespoonful of corn meal. set it to rise again, and when risen sufficiently, bake it.---Mrs. T.
I question the accuracy of the claim that the leavening is by C.
before accepting any statements about how the bread is leavened. is not to leaven the bread, but to slow and even out the rise. > was used as yeast for the making of bread. > Anybody ever hear of this? > Anybody ever try it? B-Vitamin and mineral value, but is won't grow. If it's from a Brewing store, what the heck, go for it. > B-Vitamin and mineral value, but is won't grow. > If it's from a Brewing store, what the heck, go for it. > the easy food they get from sugars and don't do well in the long run. > The wild yeasts are adapted to a different food source (the grain). What's your source for wild yeasts growing on grain? discussing all feed on simple sugars and can not directly feed on grain. They can't even directly use the primary sugar in the molasses, sucrose. on molasses malt to kickstart the process. and CO2, but they eat the same sugars as wild yeasts of the same species. > maltase (an enzyme that breaks down complex sugars to simple sugars). > grain, to make these enzymes available for mashing and brewing). enzymes in question are of plant origin and occur naturally in grain. demonstrates that some of the grain enzymes are released in fermentation. tends to be rather slow. usually associated with beta amylase production. > the grain or the resulting flour. Even with relatively "green" grain. be cheerfully chomping away on the rice in every rice paddy in the world. Oh, and that pesky bran layer that gets in the way. >> starter with plastic and it will still ferment. fermentation increase the output of alcohol and CO2. >> previously C. milleri, and originally identified as Saccharomyces exiguus. > maintained than anything else. You don't consider the Stanford Yeast Genome Database extensive enough? Usually, it's a problem of finding the right paper. that hasn't occurred, as yet. flour, and producing much the same metabolic byproducts. barm for a peck of flour. the finished product probably shouldn't taste particularly like beer. <<< That should work. Yeast depends on the packet. Yeast is alive. A vigorous starter is much better than using the dry yeast straight. If I'm doing a lot of baking, the night before, I'll take a packet and make a starter with water and flour, then feed the starter more flour and water a time or two. I don't use more than one packet, even for dozens of loaves. I don't bake often enough to keep a starter going, but that would be the period answer. is to then spend about three days getting it lively before you use it. 1 c flour + 1c water + 1/2c starter, leave 24 hours at room temperature. 1 c flour + 1c water + 1/2c starter, leave 12 hours at room temperature. Repeat. Repeat, leaving 6 hours this time, and use it. in one too many 12 hour steps. friends who would like some starter of their own. malt syrup-- yeast *loves* maltose. make it work. The book is colorful with lots of pics. Yes, I like it very much. It makes the whole subject very accessible. workshops on the east coast. <<< Is anyone familiar with this book? Subject: Re: [Sca-cooks] Leven: yeast or sourdough? Berme is Middle English for barm, so your assumption is essentially correct. beer yeasts are bottom fermenters. scattered among works on other subjects. people in period to know. think we have any really solid evidence on the subject--does anyone else? keepe the skin faire and cleare in womens faces. especially in a translation, the word might actually mean sourdough. is no reason to expect people in period to know. there are some that specifically call for "ale yeast" or "beer yeast". water and boil until it reduces to six sixths again, and keep stirring. which there should be less, and put them in a cloth bag and throw in. well) produce residue which includes yeast? that a different yeast unsuitable for use as a bread leaven? flavor issues, the big question is how much CO2 do they produce. S.
cerevisiae generates a lot of CO2 which translates into lighter bread. the quote suggests that this reference is to Pliny the Younger. the skin faire and cleare in womens faces. It isn't really the residues (lees) that you want. Been there - tried that. The resulting loaf tastes TERRIBLE. Blech. You want to get the actively fermenting foam on the top (presuming you're using Ale yeast... which you should be). But along with the yeast, you get a fair amount of liquid proto-beer. CAN you leaven bread with wine? Yep. But wine strains tend to be a little different than ale strains. They're not quite so aggressive, produce a bit less CO2 and tend to be more alcohol tolerant (as a group - there are some ale yeasts that are VERY tolerant). Wine is normally of a higher alcohol concentration than ale, so this makes sense. IF you use wine - you are essentially dumping a bunch of grape must into your bread with the yeast. And you get - grape flavored bread. Basically, it's easier to use ale yeast from beer and the result is better. Ale yeasts take to flour fairly well, and attenuate into nice baking yeasts within about a dozen uses. A lot of it is just greater compatibility for the substrate. <<< Does wine making (from grapes, although I guess other fruits and honey as well) produce residue which includes yeast? If so, can't that yeast be used to produce yeast for bread and such? Or is that a different yeast unsuitable for use as a bread leaven? from a previous batch to be used for this purpose (cf. sour-dough)." of Whete made into Past, Requyreth Ferment whych Leven we call. considered leavens, since they don't work through fermentation? an act of fermentation in period. stone crock and running up an ale pot just to test the leavening. newcastle brown - this effect was lessened. *stopped* at that temperature, but happily rose in a 65 degree house. of mine achieved playing with "spent" beer barm. rinse it with repeated baths of cold water until white yeast settles out. The process shows up in a plantation cookbook from the early 19th Century. this with a batch of traditional unhopped ale. I will one of these days. When digging up recipes for rock fish, I found some that called for yeast. is it bread yeast in sugar water? Any ideas? rising agent, as far as I can see. Is this to simply add a taste? The yeast acts as a thickener and flavor enhancer rather than a leaven. This is an early version of what is now known as "nutrional yeast." the Flemish, for instance, used yeast and had lighter bread as a result. pretty much all there was until the nineteenth century. recipes, apparently they purchased bread from a baker). Bischgoten (biscuit or biscotti) of white flour and Bierhefen (beer yeast). yeast)/ of such a dough one can make many and various pastries. Large Piscoten (biscuit, biscotti) made of Bierhefen (beer yeast). it is cool so give cold on a table/ so it becomes tender and good. And one calls it Spiesskuchen (spit cake). sprinkle it with sugar/ like this it is a good Gebackens (pastry).